Taylor, pictured with the Cullinan, believes Rolls-Royce should radically change its design as the industry switches to an electrified future. 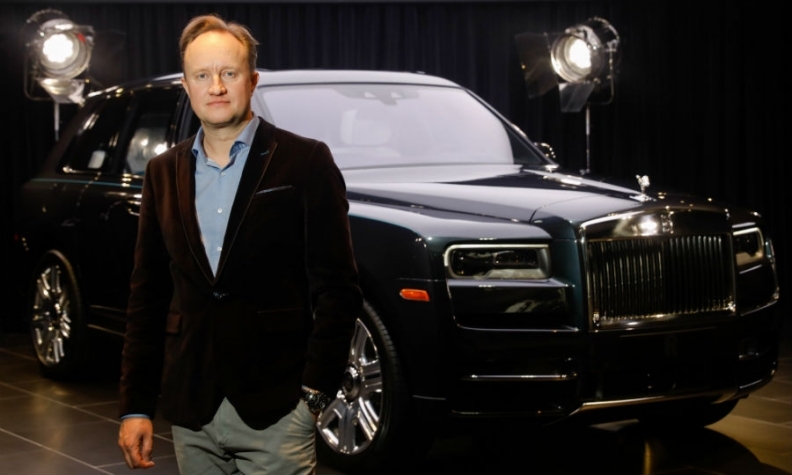 LONDON -- Rolls-Royce design director Giles Taylor has left the automaker to "pursue alternative business interests," the company said. Taylor, 50, joined BMW Group's ultraluxury brand in 2011 as head of exterior design from Jaguar, where he was chief designer for the XJ sedan. He was promoted to Rolls-Royce design director in 2012 following the retirement of Ian Cameron. Taylor oversaw the design of Rolls-Royce's latest Phantom flagship sedan unveiled last year, and the Cullinan, Rolls-Royce’s first SUV. Taylor believed that Rolls-Royce should radically change its traditional design when the company switched to battery power in the medium-term future. "Aesthetic and spiritually we are in another transition with electric power, I believe we have to register externally the brand has changed,” he told Automotive News Europe at the Geneva auto show in March. He expressed frustration with executives who hadn’t yet decided whether electric should bring about a fundamental change in Rolls-Royce’s design language. Rolls-Royce did not say who will succeed Taylor. The company offered no information on where Taylor has moved to. A source close to the automaker said Taylor has remained in automotive. The source also said that Taylor’s departure was amicable, and he was allowed to say goodbye to colleagues. Taylor studied vehicle design at London’s Royal College of Art. He joined Citroen on graduating in 1992 and created the original concept for the exterior design of the Xsara, launched in 1996. He moved to Jaguar in 1999, initially as design manager for the XJ interior.